Be That Aunt or Uncle.... Not Just to Your Siblings' Kids - JP loves LIFE! WAIT! 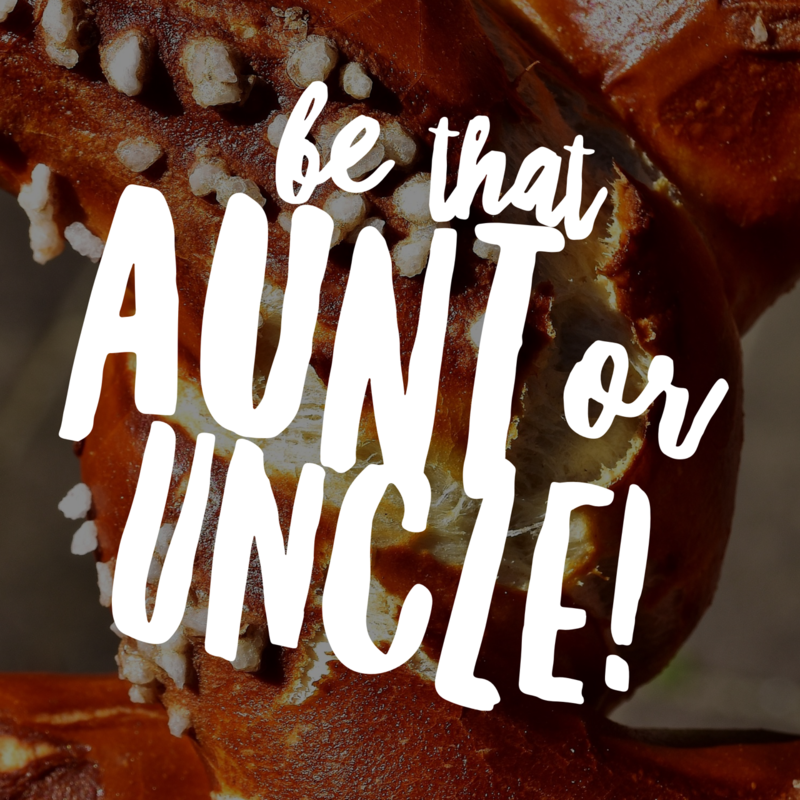 Today is #auntsandunclesday?!?! So glad Auntie Anne’s alerted me to that on Twitter. I started celebrating early yesterday by being that aunt. Let me share a story that got a 140 character mention in my stream that became a Twitter conversation and now a blog post. While waiting at the mall to get a new battery in my iPhone, I decided to get a pretzel. A young family walked up, the kids were hungry and they were nicely debating what to get (two kids wanted two different things). Young parents with 3 kids, I can remember how tight things were for others in that spot. The oldest girl (may 9?) asked about a drink and the mom said she could have water, could get something else when they got home. I TOTALLY UNDERSTAND. I looked to the mom and said, if it’s ok, I’d love to cover whatever they wanted. And just said I am an aunt living in a city without my nieces & nephews. Would be fun to spoil the kids if that was ok. The parents and kids exchanged some funny looks and agreed. I turned and told the cashier to get the rest of the orders before running my card. The kids were giddy as they said thank you. The little girl ordered her pretzel as did her brother, I asked what I could get them to drink and she said nicely, I’ll just have water. I said I’d be glad to get her something else this once and she smiled big and said, just water is fine thanks. The mom asked if they understood what I was doing. The older kids shrugged. I said it is fun to do something friendly and sometime in the future, maybe they could do it too. I grabbed my stuff and said goodbye and went to sit down for a few minutes. And I tweeted about having two hours in a mall to goof off and trying to decide what to do. Loved that the brand replied this morning saying that was time well spent. I am an aunt in a city without my nieces & nephews. Seems springing for Auntie Anne's as a pay it forward was a perfect way to spend time! So, if you are like me, an aunt or uncle who doesn’t have access to your nieces and nephews everyday, feel free to share that joy with another family. Heck, no need to be an aunt or uncle, just share the joy of a kid happily getting a pretzel or something…. no doubt it will make you smile! Yes! I always am unsure on this kind of thing but it was so fun!